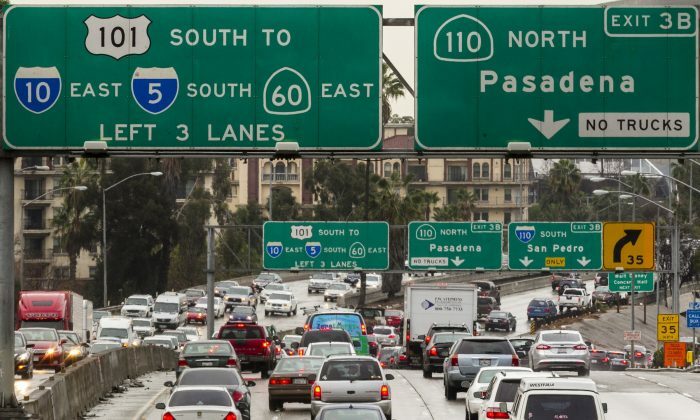 LOS ANGELES—It comes as no surprise to locals, but Los Angeles is the worst city in North America when it comes to traffic congestion, according to the latest traffic index released Wednesday by TomTom, a Dutch company famous for making GPS devices. The company used anonymous GPS data to calculate travel times during non-congestion and peak-congestion hours in more than 50 cities. The North American index (which excluded Mexico) calculated an overall 20% congestion level in 2013. Los Angeles topped the chart with 33% congestion. That means that in Los Angeles, it takes an average of 33% longer to get somewhere than it would if there were no traffic congestion. Of course, LA residents who drive through the city’s worst traffic areas at the worst times of day will tell you that it actually takes much more than 33% longer—in many cases it’s more than double. That’s because the data is a citywide average. According to the report, drivers in Los Angeles sit in traffic an extra 92 hours per year on average due to gridlock. That’s the equivalent of more than two 40-hour workweeks. Some other US cities that made the top 10 are San Francisco at number 6, Washington DC at number 7 and Houston at number 8. Canada had three cities in the top 10 with Vancouver at number 2 and Toronto and Ottawa at numbers 9 and 10. At number 15, New York City—where many people take mass transit—saw a significant decrease in congestion since the previous year. It’s down from 23% to 17%. TomTom also created indexes for foreign cities. The worst traffic in the Western Hemisphere is in one of the 2014 World Cup host cities: Rio de Janeiro, Brazil. It got a 55% on the congestion index. And the dubious award for the worst traffic congestion in the world went to Moscow, with a whopping 74% congestion. However, not all major world cities were included in the indexes, especially some notoriously congested Asian cities. This is TomTom’s fourth annual Congestion Index. They use aggregated GPS data mainly to improve their routing algorithms. New York City officials urged the state’s top court on Wednesday to reinstate the city’s ban on big sodas. Using cannabis appears to affect the size and shape of sperm—and perhaps put young men’s fertility at risk—according to a new study.